John Edgar Hoover, 1895-1972. Director of the Federal Bureau of Investigation, 1924-1972. 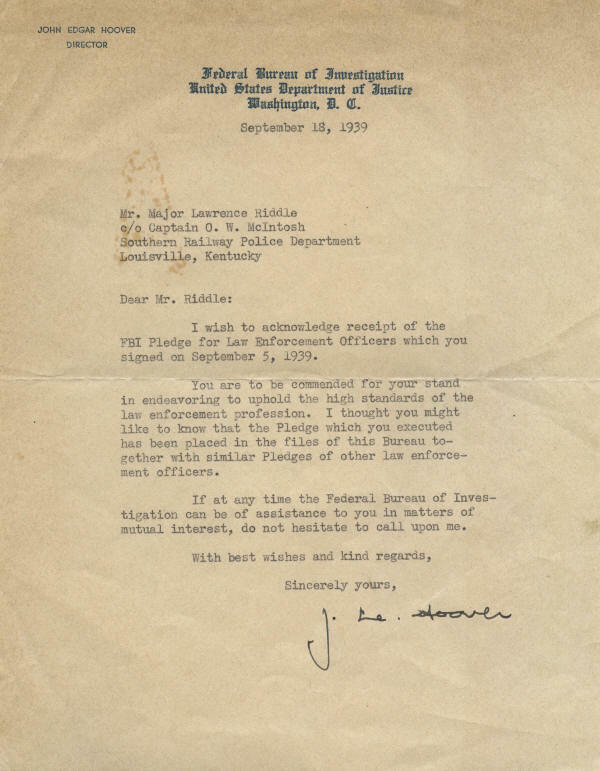 Typed Letter Signed, J. E. Hoover, one page, quarto, on stationery of the Federal Bureau of Investigation, United States Department of Justice, Washington, D.C., September 18, 1939. 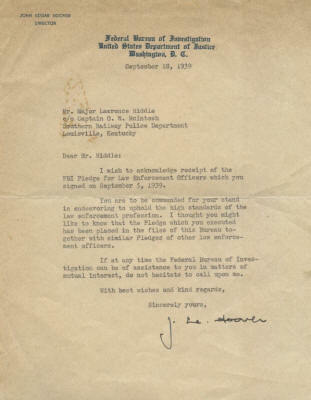 This is a vintage letter in which Hoover acknowledges receipt of the FBI Pledge for Law Enforcement Officers from a major in the Southern Railway police department. In part: "You are to be commended for your stand in endeavoring to uphold the high standards of the law enforcement profession. I thought you might like to know that the Pledge which you executed has been placed in the files of this Bureau together with similar Pledges of other law enforcement officers." Hoover has boldly signed this letter in black fountain pen. The letter is toned, has a stain affecting the inside address, and shows signs of handling. Overall, however, it is in fine condition and is a nice vintage example.